Panasonic's KX-NT400X is the super stylish high-end model of the KX-NT300X series of IP phones. It offers a large colour touchscreen only found on high end premium IP models. The reality is that most customers will never get this handset because of the cost. Unless you're really using Unified Communications with the built-in Communication Assistant Compact Edition software, it's possibly a handset the CEO gets to be different and stand out. Web Browser On Your KX-NT400X IP Phone - Is It Necessary? The Panasonic KX-NT400X phone gives you a web browser right there on your handset - this is why the screen is so large. It allows customers to develop customised applications for the phones however this is not going to happen in 99% of applications. A handset like this, as with other brands top models, is really there to showcase what the manufacturer can do. They are expensive and rarely practical. Staff already have everything they need on their PC's or their smart phones so why do they need it on their phone - they don't. A large colour screen is great because it makes it easier to visually differentiate the various elements on a large screen. Add the fact that it offers capacitive touchscreen and it's incredibly easy to use. It looks fantastic also. Brands like Samsung, Ericsson and Avaya also offer this with their premium IP handsets. If you did choose to use this as a receptionist console the one great advantage is you can connect several registered IP cameras. This is great if you have a warehouse or front door that isn't visible from the receptionists desk. You can see who is at the door before you hit a door release button on the KX-NT400X IP Phone to let them in. The KX-NT400X IP phone offers 48 customisable buttons that are accessible by simply touching the colour screen. The KX-NT400X IP displays up to 12 items on screen at any time and by toggling between the screens, it allows you to see all 48 customisable functions. It allows the handset to keep a smaller footprint whilst still providing enhanced user presence (especially with the fact that it's colour). Because everything on the Panasonic KX-NT400X IP handset is screen driven there are also no paper labels. It makes customising and changing staff presence very easy. The other handsets in the KX-NT300 IP series are more practical and cheaper alternatives. If the phone is for reception they will find it easier to see more buttons at a glance when trying to locate staff (24 vs. 12 on the KX-NT400X IP). They are feature rich and are really only compromised with the XML browser (which is not relevant to the majority, if not all, staff requirements). The other benefit is you can add extra consoles to both the KX-NT366X and the KX-NT343X IP Handset. If you did use the KX-NT400X IP phone for reception (if you needed the IP camera ability for example) then you may be better off using the Panasonic PC reception console if you have more than about 30 staff. IMPORTANT - Many customers think that you have to have Panasonic IP handsets like the KX NT400 if you're making VoIP phone calls on the phone system. This is untrue and you'll find that the Panasonic TDA30AL, TDE200 and TDE600 and the new NCP500 and NCP1000 IP pbx range allow you to mix and match ANY combination of Panasonic IP, Digital, Wireless or Analogue handsets. There is no equivalent digital offering the one of a kind KX-NT400X IP telephone however there are excellent offerings in the cheaper digital range like the Panasonic KX-DT346AL digital. It's just some friendly advice and worth considering as it's a great way to keep deployment costs down. 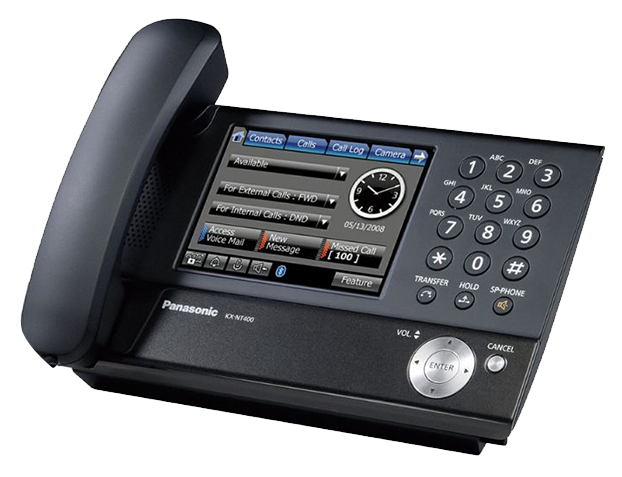 Looking to learn more about Panasonic KX-NT400X IP handset (CEO)?